Ryan Taylor calls for the ball. The graduate guard had two big three-pointers down the stretch to give the Wildcats the win. 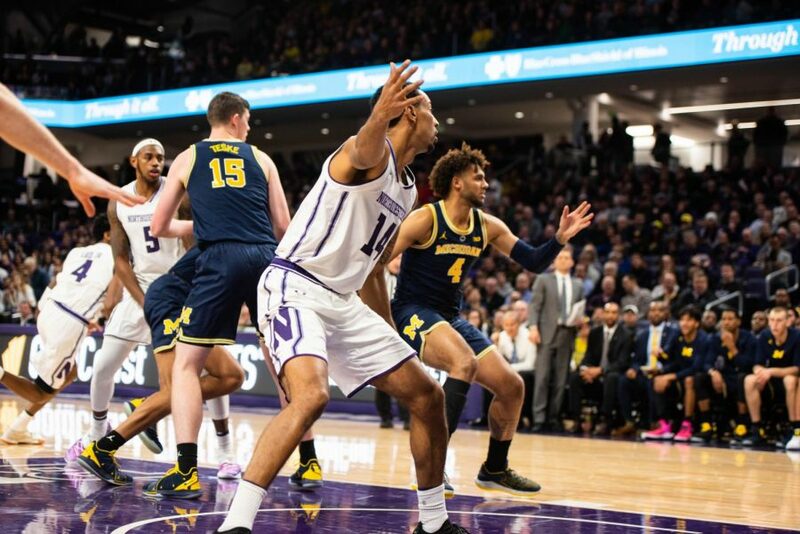 Up one point with under three minutes remaining, Northwestern was looking for a basket to regain control of the game. The Wildcats gave the ball to graduate guard Ryan Taylor, and the 6-foot-6 shooter delivered. First, Taylor, with sophomore guard Anthony Gaines and senior center Dererk Pardon setting screens on each block, ran across the baseline to right corner, where he received the pass and drained the 3-pointer to put NU up 54-50. Then, another double screen action freed up Taylor, this time on the right wing, and he put a dagger in the heart of the Scarlet Knights. Taylor’s three-pointers would be the difference as the Cats (11-7, 2-5 Big Ten) knocked down Rutgers (8-9, 1-6) in Piscataway, N.J. on Friday, 65-57. After starting a new lineup in their last game against Michigan, Collins again switched up the starting five. Senior forward Vic Law returned after missing the Jan. 13 game with a knee injury. In addition, the Cats went to their big lineup as junior center Barret Benson earned his first start of the season next to Pardon. NU’s big lineup did not get off to a good start as they committed three turnovers on offense, and the Cats gave up three baskets on defense in the first two minutes, causing Collins to call a timeout. NU settled down, shooting 54 percent from the field for the half as Pardon went 6-for-6 in the first 20 minutes. The Cats’ shooting success and good defense gave them a 33-26 advantage heading into the break. In the second half, Rutgers was able to make a couple of rallies, but each time the Scarlet Knights seemed to be on their way to corralling the lead, NU responded. First, Rutgers cut the lead to 37-36 with 13 minutes remaining. Over the next three-plus minutes, the Cats went on a 10-1 run behind an emphatic putback dunk from Gaines and two made jumpers from freshman forward Miller Kopp. But the Scarlet Knights had not yet raised the white flag and managed to tied the game at 49 with just under six minutes to go. But Law hit a jumper to return the lead to the Cats, before Taylor put the game out of reach. Rutgers would not be able to get any closer than six points away the rest of the game. Heading into the game, the status of Law was a question mark. Coach Chris Collins said he had not been on the court for the past 10 days, but was proud of his performance. The senior forward did show signs of rush — going 2-for-10 from the field including 0-for-5 from beyond the arc — but was able to contribute in other ways. He tied for the team-high in rebounds with seven and dished out a game-high five assists. The victory was the Cats’ first on the road this season. Previously, NU had been 0-3 with an average margin of defeat of 16 points. The loss also keeps the Cats out of the bottom of the Big Ten as NU is now No. 11 in the standings.